Auxiliary fence: A wooden attachment to a tool's rip fence that serves to hold accessories or prevent damage to the blade by the metal fence. Axle cap: A stamped, unthreaded cap driven onto an axle rod to hold a wheel in place. Backing board: A board attached to a drill pass to give the work a larger bearing surface and to prevent tearout. Batten: A board stretched across a number of slats or across the grain of a flat surface to increase rigidity and minimize warping. Bevel cut: A cut at an angle from face to face along the length or width of a workpiece. See miter cut. Blank: A piece of solid or glued-up wood used to create a furniture part. Board foot: A unit of wood volume measurement equivalent to a piece of wood 1 inch thick and 12 inches square. Bridle joint: A type of open mortise-and-tenon joint in which the tenon is as long as the width of the mortise piece and the mortise extends across the entire width of the board. Butterfly catch: A special latch with a winged knob designed to secure together two parts of a piece of furniture. Chamfer: A bevel cut along the edge of a workpiece. Cheek: The face of the projecting tenon in a mortise-and-tenon joint. Clearance hole: A hole bored in a workpiece to accommodate the shank of a screw. Cleat: A strip of wood fastened to one furniture part to support another. Counterbore: Drilling a hole that permits the head of a screw or bolt to sit below a wood surface so it can be concealed by a wood plug. Countersink: Drilling a hole so the head of a screw lies flush with or slightly below the surface of the workpiece. Cross-dowel: A metal cylinder threaded across its axis to accommodate a screw or knockdown fastener; usually used to provide long-grain strength when screwing into end grain. Crosscut: Any cut made perpendicular to the wood grain. Dado: A rectangular channel cut into a workpiece perpendicular to the grain. See groove. Dowel center: A metal cylinder that is inserted into a dowel hole to pinpoint a matching hole in a mating workpiece. Dowel joint: An edge-to-edge glue joint aligned and reinforced with dowels. Edge guide: A straightedge or long piece of square stock used to guide a tool during a cut. End grain: The arrangement and direction of the wood fibers running across the ends of a board. Eye bolt: A metal fastener with a threaded shaft and a ring at one end; used with a length of chain to hang porch swings. Featherboard: A piece of wood with thin fingers or "feathers" along one end to hold a workpiece securely against the fence or table of a power tool. Fence: An adjustable guide to keep the edge of a workpiece a set distance from the cutting edge of a tool. Flush trimming bit: A piloted straight router bit used to cut wood flush with a template. Four square: Lumber that has been jointed, ripped and planed so the edges are square to the faces. Groove: A rectangular channel cut into a workpiece parallel to the grain. See dado. Half-lap: A lap joint in which the dadoes are half the thickness of the stock; see lap joint. Jig: A device for guiding a tool or holding workpiece in position. Kerf: A cut made in wood by the width of a saw blade. Knockdown fitting: A fastener that allows the quick assembly and disassembly of a piece of furniture. Lattice: An assembly of narrow or thin wood stock joined together to form a grid-like pattern. Lap joint: A joint in which one or both of the mating boards are dadoed to increase gluing area and allow the surfaces of the pieces to lie flush with one another when the joint is assembled. K-L-M-N-O-P-Q Kickback: The tendency of a work-piece to be thrown back toward the operator of a woodworking machine. Miter cut: A cut that angles across the face of a workpiece; see bevel cut. Nominal size: The dimensions to which lumber is sawn before it is planed; wood is sold according to nominal size. Miter gauge: A device that slides in a slot parallel to the fence on a saw or router table, providing support for the stock as it moves past the blade or bit; can be adjusted to different angles for miter cuts. Mortise: A socket cut into a piece of wood to receive a tenon. Mortise-and-tenon joint: A joinery technique in which a projecting tenon cut in one board fits into a matching hole, or mortise, in another. Open mortise: In a through mortise-and-tenon joint, a mortise that extends through the mortise workpiece. Pattern routing: Using a template and flush-trimming bit to make identical copies of a furniture piece. Pilot bearing: A free-spinning metal collar above or below the cutting edge of a piloted router bit that guides the bit along the edge of a workpiece or template during a cut. Pilot hole: A hole drilled into a work-piece to prevent splitting when a screw is driven; usually made slightly smaller than the threaded section of the screw. Post: A vertical member in a frame assembly, such as an arbor. Push block or stick: A device used to feed a workpiece into the blade or cutter of a tool to protect the operator's fingers. Rabbet: A step-like cut in the edge or end of a of a board; usually forms part of a joint. Rail: A board running along the bottom edge of a tabletop to which the legs can be attached; in a chair, the horizontal members of the seat frame which are joined to the legs. Also the horizontal member of a frame-and-panel assembly. See stile. Reveal: A decorative feature where the face of a rail is positioned so the stile to which it is attached protrudes slightly; frequently used in table frames. Rip cut: A cut following the grain of a workpiece—usually made along the length of the stock. Rough sawn: Lumber in need of jointing and planing to render straight and square. Seasoning: The process or technique of removing moisture from green wood to improve its stability. Shoulder: In a mortise-and-tenon joint, the part of the tenon that is perpendicular to the cheek. Slat: Thin, narrow strips of wood used in seats and backs of outdoor furniture. Stave: A tapered, beveled piece of wood. 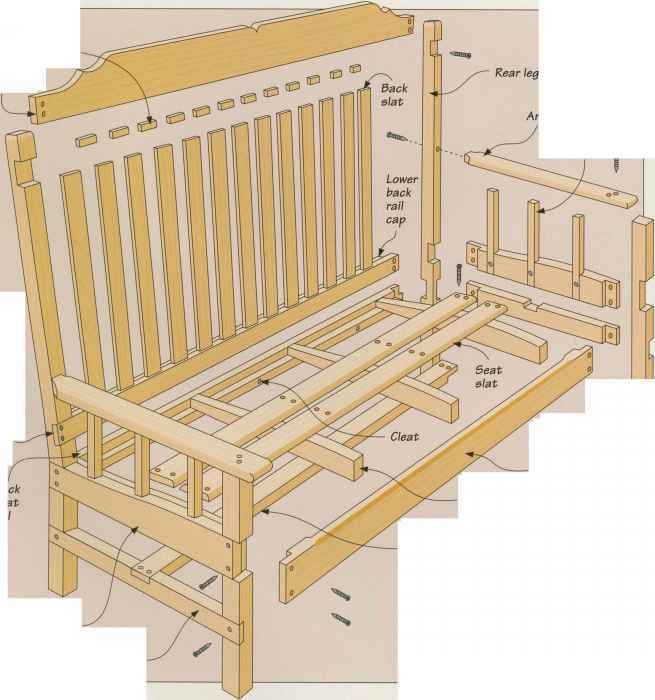 Stile: The vertical member of a frame-and-panel assembly. See rail. Stop block: A block of wood clamped to the fence or miter gauge of a stationary tool to enable a workpiece to be positioned properly for repeat cuts. Stopped groove: A groove that does not run the full length of a workpiece. T half-lap: A half-lap joint that intersects the middle of one board. Taper cut: An angled cut along the edge of a workpiece that reduces its width or thickness at one end. 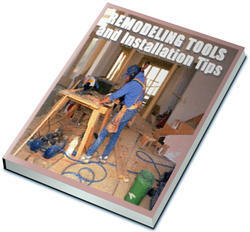 Tearout: The tendency of a blade or cutter to tear wood fibers. Template: A pattern, typically made of plywood or hardboard, used to guide a tool in reproducing identical copies of a piece. Tenon: A protrusion from the end of a workpiece that fits into a mortise. Through tenon: A tenon extending completely through an open mortise. Tusk tenon joint: A type of through mortise-and-tenon joint in which the tenon is fixed not by glue, but by a tusk-like wedge. Wood movement: The shrinking or swelling of wood in reaction to changes in relative humidity. Zinc plating: A procedure in which metal is electroplated with a thin coating of zinc; used in some fasteners. Page references in italics indicate an illustration of subject matter. Page references in bold indicate a Build It Yourself project.